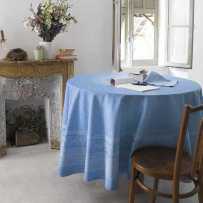 The simplicity of this dining table cloth should not make forget its quality of manufacture. 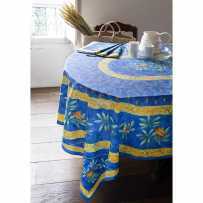 It was made by a Provencal textile house with all the know-how of the region. 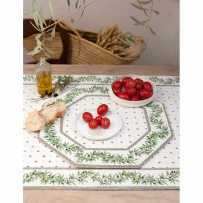 The print that reproduces the pattern of ancient faience is very typical of Haute Provence. Drawings of birds, butterflies and flowers decorate the drop on a wide peripheral band bordered by two small friezes. 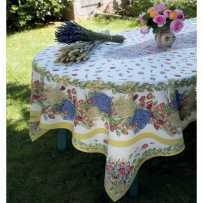 The table top is dotted with floral decorations only, very few towards the outside, denser when joining the center. There, these flowers on a white background form a beautiful sheaf. 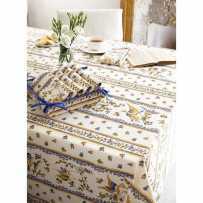 Each corner of the rectangle is orned with a floral decoration for a flawless finish, on a fabric of great holding. Refinement and delicacy are obvious through this staging. 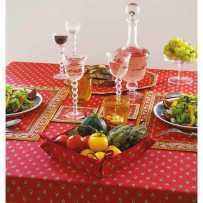 The romance of the oval tablecloth Moustiers is ideal as beautiful wedding tablecoths. 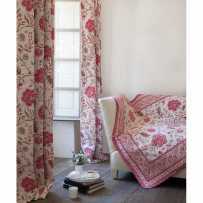 No doubt it will bring a very Eighteenth Century note and you will also have a very original Provencal touch. 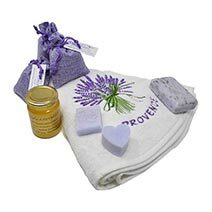 Imagine a garden courtyard with an oval table set up with Moustiers for the bride and groom, and round guest tables dressed in Moustiers round tablecloths. Some candlesticks and fine flowers of pastel color will be enough to design a beautiful reception frame. 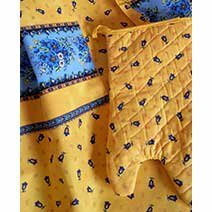 In the same collection, lovely napkins with a placed bird motif are available to complete your fabric table service. 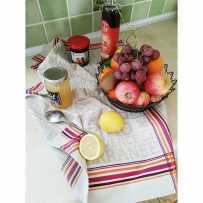 To dispose sliced bread, a square basket in Moustiers fabric with knots, very convenient to put away, is proposed in the same category. 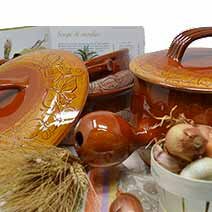 Table placemats and other kitchen items are available in our online catalog. 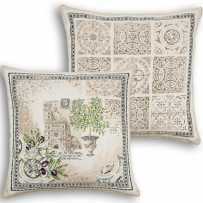 So you can compose your sets, if you like the collection dedicated to Haute Provence and its pottery village.